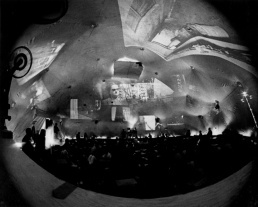 Stan VanDerBeek, Movie-Drome, c1963-65. Interior view. Documentation (PDF). Carolee Schneemann, Snows, 1967. Performance at the Martinique Theatre, NY. EAI. Artist. Still from Andy Warhol's Exploding Plastic Inevitable (1967) by Ronald Nameth. Film on UbuWeb. 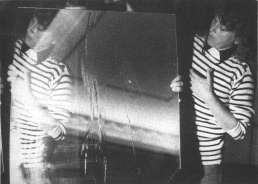 Valie Export, Abstract Film No. 1, 1967-68. MoMA. Artist. Michael Snow, Two Sides to Every Story, 1974. Installation view at Projected Images exhibition, Walker Art Center, Minneapolis. Synchronised film projectors on 2 sides of suspended screen, 16 mm colour, sound. 300 x 600 x 1250 cm. CCCA. Video. 9 Evenings: Theatre and Engineering, 69th Regiment Armory, New York, 13-23 Oct 1966. Conjured up by Robert Rauschenberg and Billy Klüver. International Underground Film Festival, NFT, London, 14-20 Sep 1970. Organised by the Robert Street Arts Lab, the co-op, the Other Cinema and other independent film distributors. Projected Images exhibition, Walker Art Center, Minneapolis, 21 Sep-3 Nov 1974. Works by Peter Campus, Rockne Krebs, Paul Sharits, Michael Snow, Ted Victoria, Robert Whitman. 46pp catalogue published. 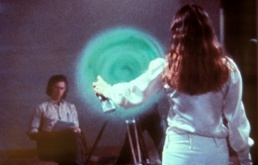 Festival of Expanded Cinema, Institute of Contemporary Art, London, 4-11 Jan 1976. Curated by Deke Dusinberre. 64pp catalogue published. Expanded Cinema season at Arnolfini gallery, Bristol, 1-10 Apr 1976. Works by Marilyn Halford, Ron Hazelden, Jeff Keen, William Raban, Tony Sinden. Landscape in Film and Video exhibition and events, LFMC / Air Gallery / B2 Gallery, London, 1983. Curated by Michael O'Pray and Jez Welsh. Video Art: Expanded Forms exhibition, Whitney Museum of American Art at Equitable Center, 1988. Curated by John G. Hanhardt. Catalogue. Curator's essay in Leonardo (1990). Into the Light: The Projected Image in American Art 1964-77 exhibition, Whitney Museum, New York, 18 Oct 2001-6 Jan 2002. Curated by Chrissie Iles. 183pp catalogue published. Curator's essay. Reviews: Kimmelman (NYT), Wilson (Frieze). Future Cinema: The Cinematic Imaginary after Film exhibition, ZKM, Karlsruhe, 16 Nov 2002-30 Mar 2003. Curated by Jeffrey Shaw and Peter Weibel. 635pp catalogue published. X-Screen exhibition, Mumok, Vienna, 13 Dec 2003-7 Mar 2004. Curated by Matthias Michalka. Review: Webber (Frieze). 216pp book published. Experiments in Moving Image exhibition, University of Westminster, 25-31 Jan 2004. Curated by Steve Littman and Jackie Hatfield. Catalogue essay by Hamlyn. Expanded Cinema: Film as Spectacle, Event and Performance exhibition, HMKV, Dortmund, 10-26 Sep 2004. Curated by Mark Webber. Featured 32 artists. The Live Record conference, BFI Southbank, London, 6 Dec 2008. Brochure. Expanded Cinema: Activating the Space of Reception conference, Tate Modern, London, 17-19 Apr 2009. Video recordings. Audio recordings. Expanded Cinema—I exhibition, Moscow Museum of Modern Art, Moscow, 13 Jun-3 Jul 2011; Garage Centre for Contemporary Culture, 24 Jun-24 Jul 2011. Catalogue. Expanded Cinema—II The Immersion: Towards Haptic Cinema, Ekaterina Cultural Foundation, Moscow, 23 Jun-19 Aug 2012. Curated by Olga Shishko. Catalogue. Playing in the Shadows conference, Tate Modern, London, 26 Oct 2012. Video recordings. Expanded Cinema—III. Mocumentary: Reality Is Not Enough, Moscow Museum of Modern Art, Moscow, 25 Jun-28 Jul 2013. Curated by Olga Shishko. European Expanded Cinema, Spoutnik Cinema/Forde Art Space, Geneva, 27 September 2013. Stan VanDerBeek, "Culture: Intercom", 1966, PDF, Log. Carolee Schneemann, "Expanded Cinema: Free Form Recollections of New York", 1970, PDF. Jonas Mekas, "On the Expanding Eye", Village Voice, 6 Feb 1964; repr. in Mekas, Movie Journal: The Rise of the New American Cinema, 1959-71, New York: Collier, 1972, pp 118-120. Jonas Mekas, "More On Expanded Cinema: Emshwiller, Stern, Ken Jacobs, Ken Dewey", Village Voice, 2 Dec 1965; repr. in Mekas, Movie Journal: The Rise of the New American Cinema, 1959-71, New York: Collier, 1972. 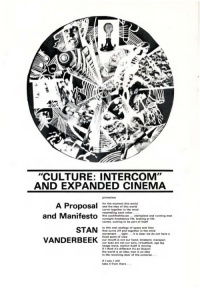 Stan VanDerBeek, "“Culture: Intercom” and Expanded Cinema: A Proposal and Manifesto", Film Culture 40 (Spring 1966), pp 15-18; repr. in Motive, Nov 1966, pp 13-23; repr. in The Tulane Drama Review 11:1 (Autumn 1966), pp 38-48. Jonas Mekas, "On the Plastic Inevitables and the Strobe Light", Village Voice, 26 May 1966; repr. in Mekas, Movie Journal: The Rise of the New American Cinema, 1959-71, New York: Collier, 1972, pp 242-244. Carolee Schneemann, "Expanded Cinema: Free Form Recollections of New York", International Underground Film Festival, London, 1970. 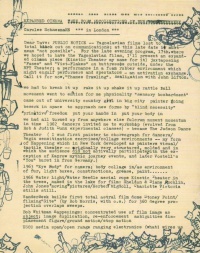 Werner Nekes, "Some Notes on Some Expanded Films", International Underground Film Festival, London, 1970. Annabel Nicolson, "Artist as Filmmaker", Art and Artists, Dec 1972; repr. in A Perspective on English Avant-Garde Film, 1978. 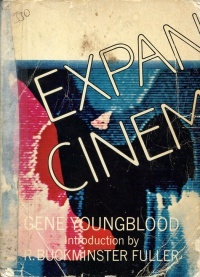 Gene Youngblood, Expanded Cinema, 1970, Log, PDF. For catalogues see Events above. Matthias Michalka (ed. 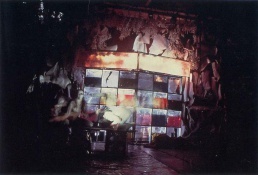 ), X-Screen: Film Installations and Actions in the 1960s and 1970s, Cologne: Walther König, 2004. Kotz's essay. Janine Marchessault, Susan Lord (eds. ), Fluid Screens, Expanded Cinema, University of Toronto Press, 2008, 368 pp. A.L. Rees, David Curtis, Duncan White, Stephen Ball (eds. ), Expanded Cinema: Art, Performance and Film, London: Tate Publishing, 2011, 304 pp. Reviews: Utterson (Screen), MacDonald (MIRAJ). Gertrud Koch, Volker Pantenburg, Simon Rothöhler (eds. ), Screen Dynamics: Mapping the Borders of Cinema, Vienna: Synema – Gesellschaft für Film und Medien, 2012, 181 pp. TOC, . Reviews: Voci (Screen), Brydon (Necsus), Casau (Comp Cinema). Erika Balsom, Exhibiting Cinema in Contemporary Art, Amsterdam: Amsterdam University Press, 2013, 260 pp. Andrew V. Uroskie, Between the Black Box and the White Cube: Expanded Cinema and Postwar Art, University of Chicago Press, 2014, x+273 pp. Omar Kholeif (ed. ), Moving Image, London: Whitechapel Gallery, 2015, 239 pp. Art and Artists: "Artists' Films", London, Dec 1972. Sheldon Renan, "Expanded Cinema", ch 6 in Renan, An Introduction to the American Underground Film, New York: Dutton, 1967, pp 227-257. John G. Hanhardt, "The Passion for Perceiving: Expanded Forms of Film and Video Art", Art Journal 45(3): "Video: The Reflexive Medium", Autumn 1985, pp 213-216. Felicity Sparrow, "Light Illusions Artists and Cinema; Filmmakers and Galleries", Vertigo 2:1 (Spring 2001). Peter Weibel, "Expanded Cinema, Video and Virtual Environments", in Future Cinema: The Cinematic Imaginary after Film, eds. Jeffrey Shaw and Peter Weibel, MIT Press, 2003, pp 110-124. Valie Export, "Expanded Cinema as Expanded Reality", Senses of Cinema 28 (Oct 2003). Jackie Hatfield, "Expanded Cinema and Narrative: Some Reasons for a Review of the Avant-Garde Debates Around Narrativity", Millennium Film Journal 39-40: "Hidden Currents", New York, Winter 2003. Jackie Hatfield, "The Subject in Expanded Cinema", Art in-sight 11 (Filmwaves 24:2), 2004, pp 14-18. Peter Weibel, "Expanded Cinema: Material Films, Film Actions (without Film), Project and Concept Films", in Beyond Art: A Third Culture. A Comparative Study in Cultures, Art and Science in 20th Century Austria and Hungary, ed. Weibel, 2005. Andrew V. Uroskie, "La Jetée en Spirale: Robert Smithson's Stratigraphic Cinema", Grey Room 19, Spring 2005, pp 54-79. Nicole Brenez, "Improvised Notes on French Expanded Cinema", trans. Franck Le Gac, Millenium Film Journal 43/44 (Summer/Fall 2005). Bruno Lessard, "Missed Encounters: Film Theory and Expanded Cinema", Refractory blog, 26 Dec 2008. Duncan White, "Mapping Expanded Cinema", Vertigo 4:2 (Winter-Spring 2009). Marc Glöde, "Expanded Cinema", in See This Sound Compendium, c2009. Duncan White, "British Expanded Cinema and the ‘Live Culture’ 1969–79", Visual Culture in Britain 11:1 (2010), pp 93-108. "Expanded Cinemas Exploding", in Film Unframed: A History of Austrian Avant-Garde Cinema, ed. Peter Tscherkassky, Vienna, 2012. Andrew V. Uroskie, "Visual Music After Cage Robert Breer Expanded Cinema and Stockhausen's Originals 1964", Organised Sound 17:2, 2012, pp 163-169. Paul Hegarty, "Expanding Cinema", ch 1 in Hegarty, Rumour and Radiation: Sound in Video Art, Bloomsbury Academic, 2014, pp 19-31.
gary comenas, "Jonas Mekas and the Film-Makers' Cinematheque", WarholStars.org, 2014. Nadja Millner-Larsen, "The Subject of Black: Abstraction and the Politics of Race in the Expanded Cinema Environment", Grey Room 67, Spring 2017, pp 64-99. This page was last modified on 30 March 2019, at 17:45.